This pack of 4x 12mm galvanised wire grips complete with Nyloc nuts for added safety, is what you need to go with your 12mm zip wire cable for your zip wire. 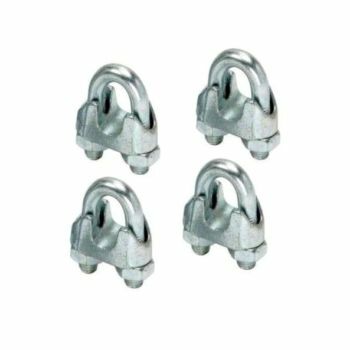 Wire grips, which consist of a u bolt, bridge and two hex nuts, in our case Nyloc Hex nuts, provide a simple and very effective means of making either a soft loop or thimble eye loop in wire rope. When using wire grips to make a loop, please make sure that you follow the safety fitting instructions that are supplied in each pack and which you can find below. Please follow these simple safety rules when using wire grips on your zip wire installation. Please note that the bridge of the wire rope grip should always be placed on the load bearing part of the rope. These wire rope grips should be fitted to the wire rope as shown in the figures below. The U-bolt of the grip should be placed on the rope tail, also known as the dead end of the rope. Turn back enough wire rope length so that your 4 wire grips can be installed according to the instructions below. The first grip must be placed one bridge width from the turned back rope tail or dead end of the rope, according to figure 1. Tighten the nuts taking care not to over tighten. The second grip must be placed immediately against the thimble but nevertheless in such a position that the correct tightening of the grip does not damage the outer wires of the wire rope (figure 2). Tighten the nuts firmly but not fully tightened. The remaining 2 grips (4 in total) should be placed on the wire rope between the first and second grip in such a way that they are separated by at least 1½ times the grip-width with a maximum of 3 times the grip-width, according to figure 3. Apply light tension on the rope and make sure that all nuts are now tightened evenly. Once all the nuts have been tightened, make a final check that all nuts are tight. All wire grips and nuts should be inspected on a regularly basis depending how much your zip wire is used. It is suggested that you inspect these wire grips on a 3 monthly basis as a minimum and that they are free from nicks, gouges and cracks and re-tightened if needed. If the equipment is being heavily used, then we suggest that the wire grips be inspected on a monthly basis. If any damage is noticed the please replace the zip wire grips as necessary.